You can’t go back in time to become a World War I pilot, or if you have a time machine we’re assuming you have a better source of period clothes. You could get your pilot’s license, but that seems like a lot of work. And who can afford a plane? What you can do is put this Vintage Pilot Helmet and Goggles on and feel like a real pilot, ready to take on the Red Baron, Red Skull, or whatever other crimson menace you can come up with. Then, all you have to do is pretend your ride is a Sopwith Camel and you’re set. 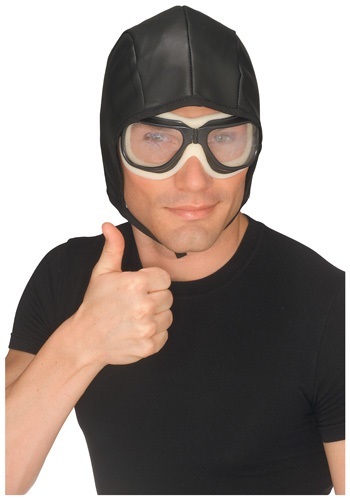 Perfect for any early 20th century pilot costume, including Charles Lindbergh or Amelia Earheart––and you won’t even have to have your baby stolen or disappear over the ocean to rock this cool aviator look! If you’re the subject of fascination for years after your death, it’ll only be because you look so cute in this getup! Aviation’s gotten a little safer over the course of the last century. They say flying in a plane is safer than riding in a car. But that shouldn’t stop you from wearing this Vintage Pilot Helmet and Goggles in coach if it makes you feel better––what if someone cracks a window?